I received this book for free from Author, CLP Blog Tours in exchange for an honest review. This does not affect my opinion of the book or the content of my review. What would you risk to be with the love of your life? A family is threatened by an irresistible attraction in this compelling debut that will appeal to fans of Liane Moriarty and Anita Shreve. Looking back on it now, I can see it was instant. the second we locked eyes. Boom. Just like that. the me I had spent a lifetime perfecting began its disintegration from that moment. And despite the carnage it brought to all our lives, I still don't regret it. At the mention of her husband, I couldn’t help myself asking about him, despite the knot in my stomach. ‘His name’s Adam,’ said Mel. ‘He’s an anaesthetist. We’ve been married fourteen years.’ She bit on her lower lip. ‘Is he a good guy, this specialist who never tells his wife she’s beautiful?’ I asked, narrowing my eyes. I expected her to laugh at my expression but she didn’t. ‘He is a good guy. He’s a really great guy, actually.’ She looked at me for a second. ‘I do love him.’ She chewed on her cheek, hesitating. ‘But he doesn’t make my belly flip.’ She hung her head as soon as the words were out. That’s the moment when everything changed. When she said that. That’s the moment she was exposed and I knew for certain I had a real chance with her. Tess Woods is a physiotherapist who lives in Perth, Australia with one husband, two children, one dog and one cat who rules over all of them. 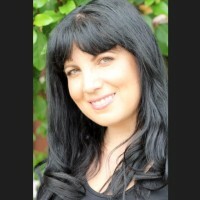 Her first novel, Love at First Flight, released by HarperCollins in April 2015, received worldwide critical acclaim, hit the best-seller charts in Australia, and was voted Book of the Year in the AusRom Today Reader’s Choice Awards 2015 where Tess was also top ten nominated as Best New Author. Love at First Flight was the first HarperCollins Australia digital book to be given a print release in August 2016. It went to reprint and went to number one on the Booktopia charts – both pre-release. Tess’s short story, Destiny in a Day, released in the anthologyHot Stuff: Surfing Love is set in beautiful Cornwall, where she dreams of living one day and Tess is currently working on her second full-length novel, Beautiful Messy Love. When she isn’t working or being a personal assistant to her kids, Tess enjoys reading and all kinds of grannyish pleasures like knitting, baking, drinking tea, watching Downton Abbey and tending to the veggie patch. Sign up for her monthly newsletter containing writing tips, book reviews, recipes, quizzes and fabulous prizes delivered worldwide in every issue!